Conference Overview: The California Department of Public Health (CDPH) and California Department of Social Services (CDSS), in collaboration with the Center for Injury Prevention Policy and Practice (CIPPP), came together to sponsor the very first collaberative conference to promote awareness, communication, and collaboration among public health, social services, and other dedicated professionals committed to injury prevention and ensuring the safety of children: "Discover the Connections : Bridging Strategies to Prevent Child Injury and Maltreatment”. The conference illustrated shared issues in unintentional injury and child maltreatment ranging from cause-based factors of brain development and early life experiences to evidence-based strategies for intervening and preventing life-long suffering to children and adolescents. Best practices in public health and child welfare were explored for opportunities to advance primary prevention and encourage a more integrated approach to programs and services within communities. 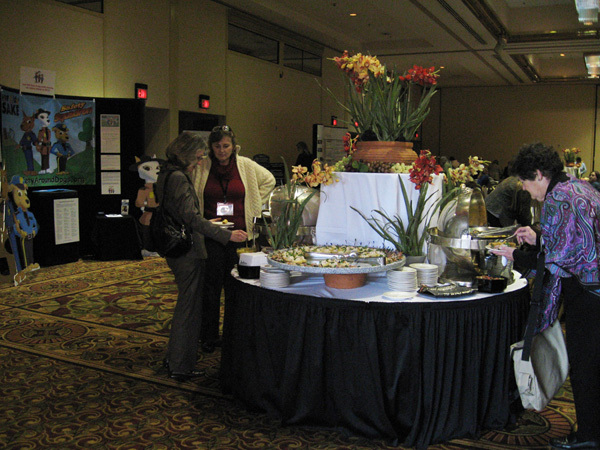 The conference also included a hosted networking reception the evening of February 25, 2008. Purpose: In California, nearly a million children are at risk for abuse and neglect. Injuries are the number one killer of children ages 1-18. Child injuries, neglect, and maltreatment have been linked with a host of immediate and long-term negative and costly outcomes, ultimately affecting the child's ability to develop normally, impacting the family, community, and society as a whole. Many child injury and maltreatment prevention efforts focus on shared populations, causes, and strategies. We know that community norms, social values, and personal worldviews all influence the way individuals and groups within the larger community support families with children. The key is to shift these norms and values toward helping create and sustain healthier environments for families to raise their children. Identifying, developing, and modifying existing prevention programs that contribute to the positive physical, emotional, cognitive, and developmental well-being of children and adolescents are long- term investments in our collective future. according to Kris Crawford of For Pits' Sake. The Program: This conference offered a highly knowledgeable and experienced faculty from around the country who guided attendees in the exploration of research and practice on important topics, including: Effective collaboration between unintentional injury and child maltreatment practitioners; Implications of early adverse experiences on lifelong health issues; The effects of brain development on risk behavior in children and adolescents; Tools and strategies from public health and social service disciplines that help inform multilevel prevention efforts; Cross-disciplinary education to increase awareness of each discipline's objectives, challenges, strengths, and resources. 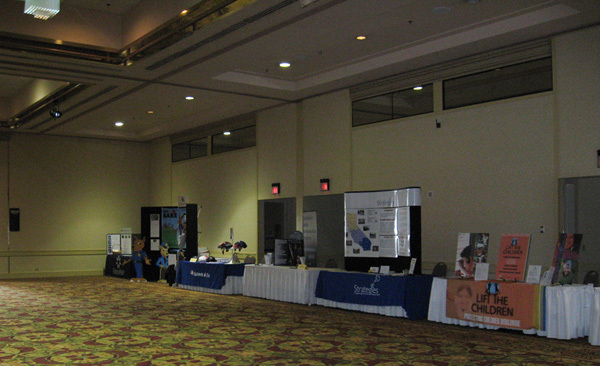 Over 500 colleagues from state, county, and local health and safety agencies; schools; advocacy groups; social service departments; community-based organizations; private practice; and others, networked and shared strategies to successfully engage and explore ways to prevent child injury and maltreatment. California Attorney General's Office - The California Attorney General's Office creates and promotes effective policies and strategies for law enforcement and communities to build a safer state for children, families, and communities. California Kids Plates Program - The California legislature passed a bill in 1992 allowing for the sale of specially designed California license plates with revenues generated to be deposited into the Child Health and Safety Fund to support child safety issues in California. California Highway Patrol - In 1999, the California Highway Patrol was awarded a federal grant for the California Child Passenger Safety Program to reduce the number of fatalities and injuries in traffic collisions involving children. California Poison Control System - The California Poison Control System (CPCS) is the statewide provider of immediate, free and expert treatment advice and assistance in case of exposure to poisonous, hazardous or toxic substances. California Chapters of the Brady Campaign to Prevent Gun Violence - Every day in America, eight children are killed and more than forty-four are injured by a firearm. The California Chapters of the Brady Campaign to Prevent Gun Violence work on state and local legislation, public education, coalition building, and support to victims of gun violence. Prevent Child Abuse California - The Child Abuse Prevention Center has been working with researchers, communications professionals, public agencies, child abuse prevention councils, prevention programs, and families to develop a five year social marketing campaign to prevent child abuse. Safe Belt Safe U.S.A. - Safe Belt Safe U.S.A. is the national non-profit organization dedicated to protecting children from deaths and injuries in motor vehicle crashes. Helmets R Us - Helmets R Us is a non-profit company that works directly with non-profit organizations and schools in efforts to promote bicycle safety. Children's Hospital Los Angeles - The Trauma Center at Children's Hospital in Los Angeles (Acute Care, Injury Prevention, and Disaster Preparedness) believe that prevention is the only way to break the cycle of unintentional injuries and have made injury prevention their top priority. "It takes a lot of children to grow up happy and whole. The least we owe them is safety as they make their way." Lift The Children - Lift the Children is an independent agency of the Child Abuse Prevention Center that works internationally to promote the basic right of children to live in safety and dignity. Orange County Department of Education - The Orange County Department of Education's vision is to empower individuals, families, organizations, and communities to reduce children's exposure to injury and violence and reinforce the belief that "Every Child Is My Concern." Strategies - Strategies exists to provide training, technical assistance, coaching, and facilitation to government and non-profit agencies engaged in child abuse prevention activities. Disclosure: A Path to Self-Discovery Card Game - The Disclosure: A Path to Self-Discovery Card Game is for those in the mental health and family counseling profession to assist youth in opening up dialogue and enabling them to reveal themselves in a non-threatening and non-competitive manner. Each year nearly 2.8 million children are bitten by a dog. The Center of Disease Control and Prevention (CDC) estimates half of all children 12-years-old and younger have been bitten by a dog, resulting in injuries of varying severity. In fact, dog bites are the second most frequent cause of emergency room visits for children. Even worse, 79% of fatal dog attacks involve children. According to Kris Crawford of for Pits' Sake. Contrary to popular belief, most of these bites are not coming from a “scary” dog that got loose. Statistics show that half of all dog bites come from the family's own dog, and another 40 percent come from a friend or neighbor's dog. Many times, dog bites are much more than an innocent little nip — they often require hospitalization or even surgery. Even dog bites that are considered minor can cause serious, even permanent, psychological damage to a child. Dog bite prevention is conspicuously absent in the curriculum of preventable childhood injury education. Research shows that just ONE hour of dog safety training can reduce attacks by 80%! 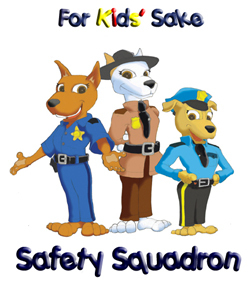 We teach children bike safety, water safety, never talk to strangers, etc. We need to teach children how to be safe around dogs in exactly the same way as we teach safety around any other potential risk or hazard. Said Kris Crawford and Kristine Crawford. Deputy Dakota, Trooper Tahoe and Sgt. 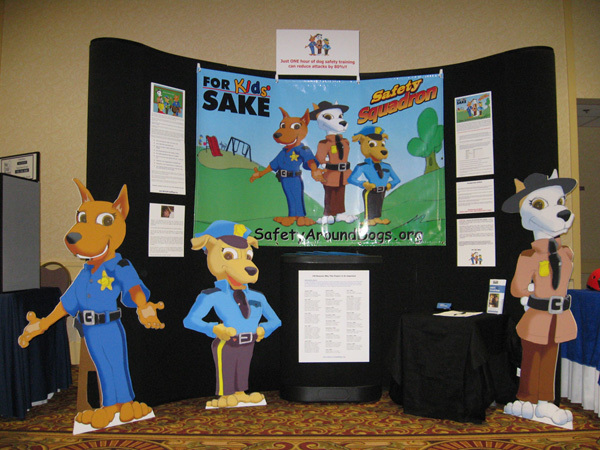 Cheyenne of the For Kids Sake Safety Around Dogs Project promote public awareness, education, and advocate prevention strategies for this easily preventable injury.